Begin by speaking to Pirate Pete outside of Port Phasmatys. Speak to Pirate Pete outside of Port Phasmatys, to the north. He is located on a small deck east of the Ectofuntus. Agree to help Pirate Pete claim back his family's sword so that he may present it is as proof of his rulership. In order for him to reclaim his family sword, you must defeat Barrelor the Destroyer. Pete says that he guards it within the deadly Trapped Pit of Barrelor. Agree to help defeat Barrelor, and that you will let him keep the money. He will knock you out, and bring you to an island. 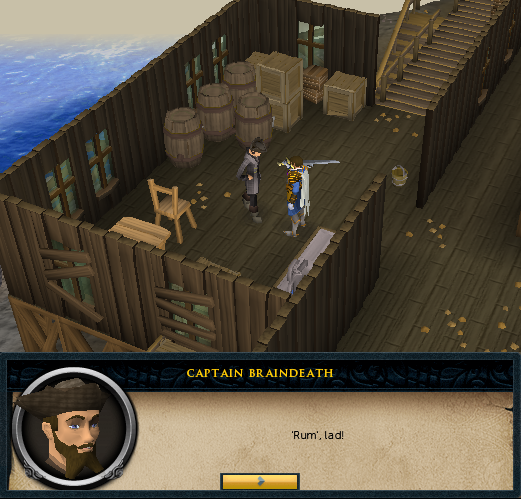 The story was a hoax, and Captain Braindeath tells you a story how you wouldn't remember that you agreed to help him. He tells you are on Braindeath Island. The whole island is a brewery for alcoholic beverages, and where the island remains is a secret. He speaks of "them" by speaking how he and his crew kept them off of themselves. He points through a window of zombies, and begins the quest. Captain Braindeath tells you how the zombies protested after they stopped fighting. The Captain wants you to get the Zombies' Captain drunk enough, to make them stop protesting. He now wants you to go out to the front and grow some Blindweed. If you did not bring farming supplies, climb down the ladder to the west, and enter a basement full of fever spiders. Don't attack any or you will become diseased. Head to the southeast corner and open the cupboard, take out all of the supplies. Even though you receive a watering can, you will not need it so you can just drop it. Climb down the stairs and find the Blindweed patch to the south. Be careful of Zombie pirates (levels 68 and 72). Rake the patch and then plant the seed. Wait for them to grow, pick them, and bring them to Captain Braindeath. Head upstairs and put the Blindweed in the hopper, and go back to the Captain. Now, you need Stagnant water which is located to the north, so pick up a bucket from the respawn next to Captain Braindeath. Climb down the stairs to the south and pass by the zombies, and go to the west. Go north and enter the gate. Ignore 50% Luke and head north. Find your way up the mountain to the very top. Use your bucket with the Stagnant Lake and head back to the hopper. Use the bucket of stagnant water with the hopper to dump it in and then go back to the Captain. He now wants you to collect 5 Sluglings. You will need to put them into the Pressure Barrel in the attic next to the hopper. He will give you a Fishbowl and Net. These need to be tangled together to fish for Sluglings, but it is possible to untangle them. If you accidentally do this, simply use one with the other to tangle them together again. Climb down the staircase, head southeast, and use the fishbowl and net with a fishing spot. If there are no spots, wait for them to appear. Continue catching sluglings or Karamthulhu until you have 5 of them. Now, head to the hopper and put them inside the pressure count barrel. Pull the pressure lever to "pressurize" them. Now go back to Captain Braindeath. The Captain tells you that some of his equipment is possessed. He will give you a wrench to fix all of the ghostly items. First off, you need to find someone who can bless it for you. Head west and enter a room with a man named Davey. He will bless your wrench. You will now have a Holy Wrench. 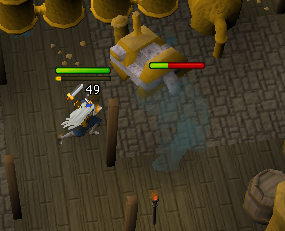 If you have it in your inventory, and you take a drink of a Prayer Potion, you will get one more point with the wrench in your inventory. (If you are not prepared to fight the Evil Spirit, talk to Pirate Pete and restock at Port Phasmatys.) Now, head off to the east to the shaking Brewing control. Use your wrench with it and a level 80 Evil Spirit will attack you. Kill it, and now the brewing control isn't possessed anymore. Go and talk back to the Captain. He now wants you to capture a body of a diseased Fever Spider for the last ingredient. 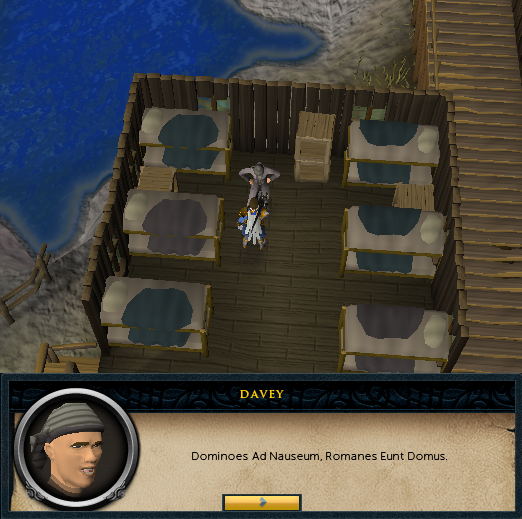 In order to not become diseased, head to a slayer master (Mazchna in Canifis is closest) and buy a pair of slayer gloves for 200 gold. Head back to the Island and enter the basement. Kill a Fever Spider to get a carcass, and then head to the hopper. Cram the body into the hopper and go back to the Captain. He will mix up the brew, and now he wants you to feed it to the pirates. Feeding it to the Zombie Captain will get rid of the others. Go south of the brewing machine and find an action called "Turn Output Tap." While carrying a bucket, turn it to get the brew, and go to Captain Donnie by climbing down the staircase. Use the brew on him and he will drink it. In a drunken state, Donnie exclaims that Rabid Jack would have his hide if he knew it was him who sent him. Return to Captain Braindeath to claim your reward. 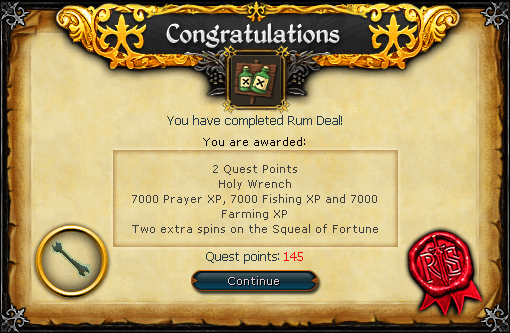 Holy Wrench 7,000 Prayer experience 7,000 Fishing experience 7,000 Farming experience Bard Roberts in Port Sarim's pub will sing you a shanty of the adventures you had on this quest.